Apple drops the price of it's iPhone 8GB from $599 to $399, a few hours after announcing the launched of the new iPod Touch. The usual breaking news from Apple just makes one think about marketing principles. Is it too early for a drop? What were they thinking? 1. Consider base's negative opinion on a price drop. Is it negligible and will have no adverse revenue impact? Apple had this factored in for sure. The brand is too strong to get a backlash. it might erode the premium positioning. the rationale of Apple at this point. 3. Is it being done to maximize average revenue along product lines? 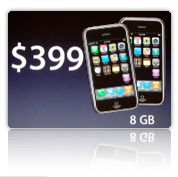 That is, is the new volume from the new $399 8GB being used to compensate for low sales in the 4GB model? 4. Is it to early for a price drop? I would have waited until October for the Holiday Season. 5. No rebates for the one who bought the iPhone just 2 weeks back. 6. Is the price drop and marketing share being used to cement positioning of the brand? I think there should be a law to protect consumers about that. But regardless, the volumes should make it happen. An interesting point is whether Apple is spreading itself too thinly by launching multiple devices? My bet - it doesn't matter at the moment because they have prime mover advantage and they are the clear market leader.